In this collage of photos, all of them depict impending death. The one on top is The Starving of Sudan, shot by Kevin Carter in 1993 when he went on an assignment to report on the famine. 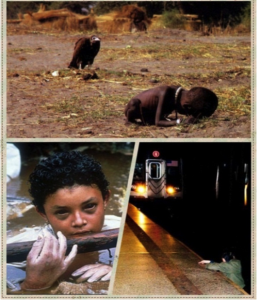 It’s about a vulture waiting for a starving and skinny child to die so that it can eat him up. Carter said that he had spent 20 minutes adjusting the camera to take the best shot because of the demand from his profession, but he felt painful deep down his heart. Immediately after clicking the pic, he fled from the scene since he could not tolerate the disturbing situation in Sudan where millions of other kids were starving to death. The photo in the lower left is“Omayra Sanchez-Colombia Mudslide” taken by Frank Fournier. This haunting image shows a thirteen-year-old girl got trapped under the huge mudslides of volcanic ash and that due to lack of supplies rescuers were not able to free her and for three days she sat in the water waiting for help. Reporters arrived and photographed her throughout her ordeal bravely giving interviews while people vainly tried to help her. The other photo is Doomed Man on Subway Tracks published in New York Post on December 4, 2012 by Michael Zhang. It shows 58-year-old Ki Suk Han who is moments away from being struck and killed by an oncoming subway train. He was pushed onto the tracks by a beggar and tried hard to lift himself out of the track, but didn’t make it. A freelance photographer R. Umar Abbasi was at present, he began using his camera flash to warn the train’s operator, but the train couldn’t stop because it was too fast. So he was unable to rescue Han. Ideally, all the three intention grabbing images should be given equal status when it comes to the impression on the viewers because impending death pictures convey far beyond information than what can be seen. They convey open-ended ambiguity and uncertainty over their more factually certain counterparts. They serve an anticipatory moment, leaving the story’s resolution open to questions and encouraging the viewer’s engagement. However, now that I rethink about them, one of the three just pops out and becomes the most impressive one. The little African girl with her desperate eyes really haunts its viewers. The first thing that catches my eyes is her face and hands. Her blue, clammy eyes, her deathly white fingers kind of draw me in. The background behind the little girl is pretty vague. Like, maybe there is no real context, like no definite surroundings, especially compared to the girl herself, since every subtle idea under her expression is attentively captured and well-defined. The photo shows a sense of isolation and it is the power of this approach: simplification. Different from other two images where the composition of the picture seems more complicated, the “Omayra Sanchez” one is simple, basically only a girl centered. But the distance between the girl and the viewers are much closer. And the power of the girl is somehow much stronger. Omitting all the unnecessary details, it’s like in a triangle where the catchiest image has the balance among the photographer, the viewer, and the character itself. This image makes the fittest balance. “Less is more,” this is the golden rule that we apply not only in busy lives, but also in iconic photographs. Basically, “less is more” rule means to decide on a clear center of attention, and have as few details as possible because sometimes details can be distracting. In the topics like “impending death” photographs, usually it is a specific object (or person) that is so capturing. So frame the shot to omit distractions and noise. Remember that someone who sees your picture later won’t know about anything that is not in the frame, so leave as much to their imagination as you can. This is how Fournier the photographer stands out. “Simplify, simplify.” Thoreau said it, William Zinsser in his book On Writing Well restated it, and piles of writers practice it consistently. And this could be, more often than not, the unconventional approach adopted in impending death pictures as well. Smith, C. Zoe. “About to Die: How News Images Move the Public.”Journalism History 37.2 (2011): 128. Zelizer, Barbie. Introduction. Remembering to Forget: Holocaust Memory through the Camera’s Eye. Chicago: U of Chicago, 1998. N. pag. Print. “10 Photography Tips To Better Capture What You See.” Improve Photography. Photography LLC, n.d. Web. 13 Oct. 2014.